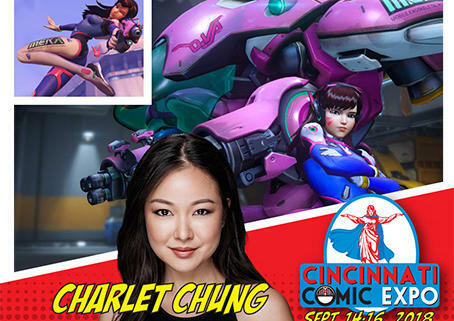 “D.Va: 1, Bad Guys: 0.” Actress Charlet Chung is making her first visit to the Queen City by coming to the 2018 Cincinnati Comic Expo! In addition to her role as D.Va in the Overwatch and StarCraft video games, Charlet is recognized for numerous other projects. Charlet has appeared on-camera on such shows as Weeds, 90210, Chuck, and MADtv. Her voice has also been heard in numerous game franchises such as Call of Duty, Agents of Mayhem, and State of Decay. 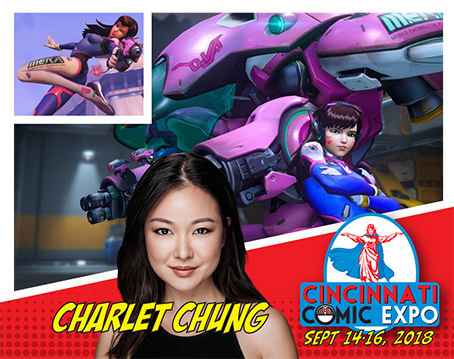 Get your admission tickets to the 2018 Cincinnati Comic Expo for an opportunity to get an autograph and photo on Friday and Saturday with Charlet Chung: goo.gl/R4ZeWa.